"In fifteen short poems, Kenneth White describes Hong Kong. The design represents the bay of Hong Kong 'floating' on the sea at dusk. I dyed the leather for the covering and the onlays using different techniques, including suminagashi for the sea and craquelé for the buildings. Gold-tooling for the windows and the title. 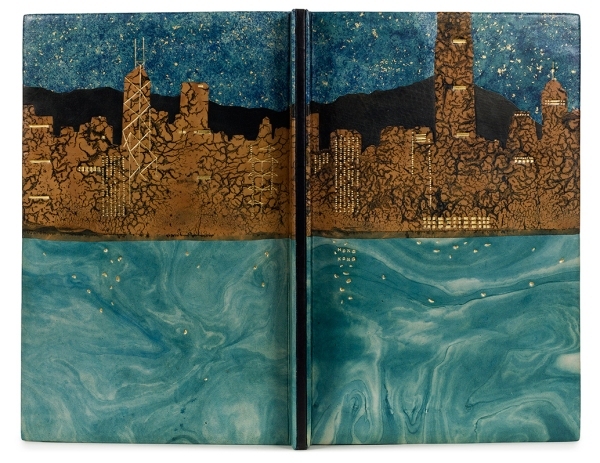 The endpapers are made with suminagashi paper sprinkled with gold." 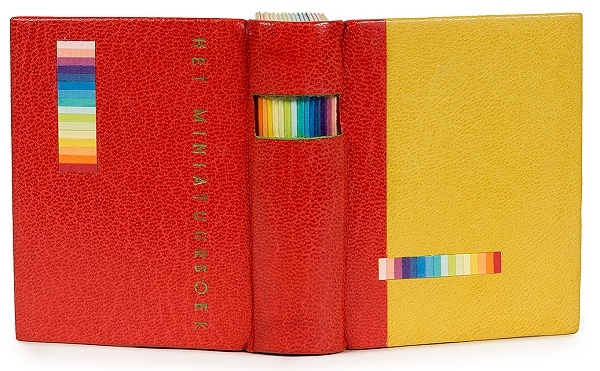 Traditional French binding in three colours, board on board, open spine with visible coloured sections. Hand-sewn headbands. Title tooled by hand. Decoration of coloured paper the same as the sections in the front and back. A catalogue showing all of the entrants to the competition is available to purchase from us here.